Both these products are described as a repairing and strengthening formula for the hair. It is mainly targeted at frizzy, damaged or colour treated hair The products promise to restore the damaged hair shaft and tame rebellious frizzy hair. Argan oil is generally known as the miracle oil because it contains fatty acids and vitamin E that are very beneficial for the hair and skin. It is known to make hair silky soft, tame frizz, treat split ends and give hair a healthy shine. The shampoo is quite thick and creamy. I lather it all over my hair and it does a great job in cleansing my scalp without irritating it or making it dry. I like to shampoo my hair twice for a thorough clean. These shampoos are sulfate free, so it takes a while to lather up but in the second wash my hair feels squeaky clean. The conditioner is creamy white and has a lotion like texture. I have very long and thick hair so I always douse my hair in conditioner and leave it on for 15 minutes or more so that my hair gets a deep conditioning. I just love the way the conditioner moisturises my hair. When I rinse the product out my hair feels super soft to the touch. It makes brushing and styling my wet hair way more manageable. The end result is absolutely amazing. 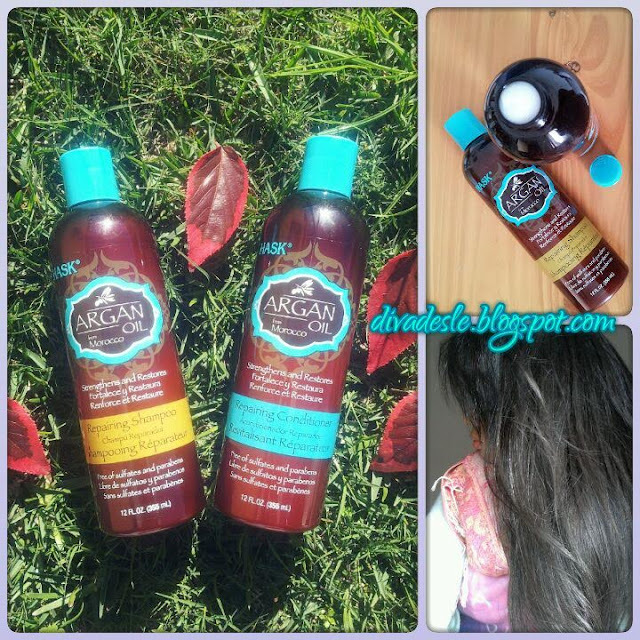 My hair feels silky to the touch, nourished and has a healthy shine. The shampoo and conditioner moisturises the hair without making it feel heavy or oily. My hair is left with lots of volume and bounce but still super soft and smooth. I like that the product fragrance is not overbearing. It has a light citrus smell that is very refreshing and uplifting. It smells lovely on the hair too. I really love these hair products and recommend them to anyone. The products come in a 355 ml bottle, so they will last quite a while too. Have any of you lovely ladies tried this range? Let me know below! I've been wanting to try these for ages, but always end up walking out with something else :) They do smell amazing though, and I look forward to your other reviews! I'm currently testing them now. I caught them on sale just as you did and then a PR person saw my blog post where I talked about trying it and sent me some more. Your hair looks beautiful. I've been using Hask Argan 'miracle' Oil shampoo, conditioner and healing hair shine treatment ... there's a remarkable improvement in my hair. It's healthy and shiny. Love the fact that these are cruelty-free! I am obsessed with oils at the moment! Don't think we have these here though! I love that you found such a good product. 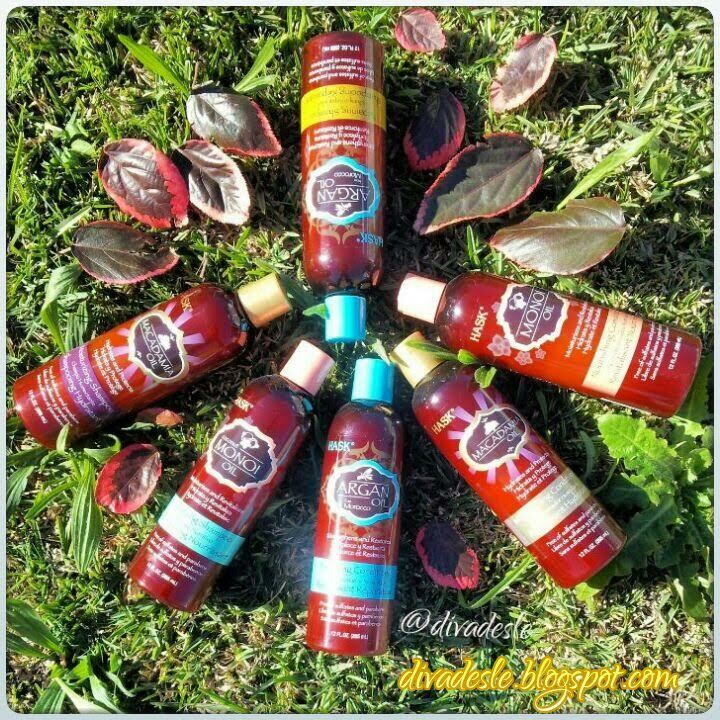 I have noticed these products but with my hair being so temperamental I hate trying anything that I don't have personal reliable reviews on... so thanks for sharing Desle!